Miami's Peacock Bass Fishing - an experience and a half!! 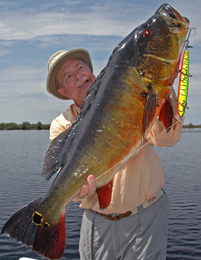 Peacock Bass were introduced into the canal system of South Florida in 1982. Two years later the hunt for them took off in earnest. It has been a love affair ever since. In early August of 2008 I had the chance to go Peacock Bass fishing for the first time. I met with my guide, Brett Issakson of Hawghunter.net, at a small bait shop in suburban Fort Lauderdale. We loaded up on supplies (some cheese crackers and water) and immediately headed toward Miami Lakes, trailering Brett's 17 ft. bass boat behind his pick-em-up. 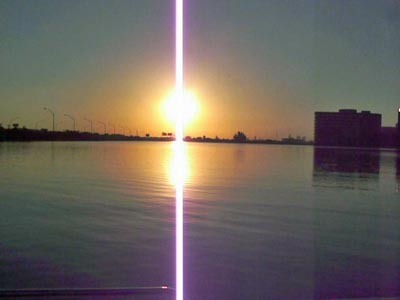 It was only 63 degrees (very cool for a Miami morning) when we arrived at the launch ramp. Let me now set this surreal scene. Generally speaking, when I go fly fishing , I am surrounded by beautify countryside, tall mountains, and/or swift flowing cool rivers, with nothing but the sounds of cicada's or other assorted insects and birds to break the silence of the moment. Today, it was definitely different. I was surrounded by Miami International Airport and the noise of 767's (et al) taking off and landing. 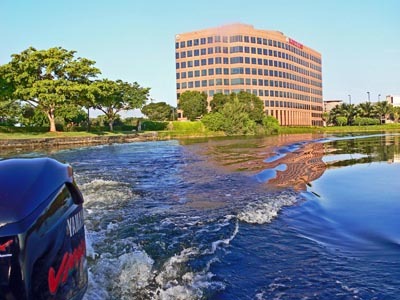 Instead of tree-lined banks, the view was of the national headquarters of Burger King, as this was the land of corporate America. "We are going fishing here?” I thought to myself. Brett launched his bass boat into the lake and we headed out in search of the transplanted Amazonian fish. Brett's boat could do 73 mph (a tad faster than the drift boat I was on the week before in Tennessee), but he kept it down to a mere 60 mph. Thanks a lot!! Actually, 60 mph isn't all that fast if you are in the middle of a wide lake. 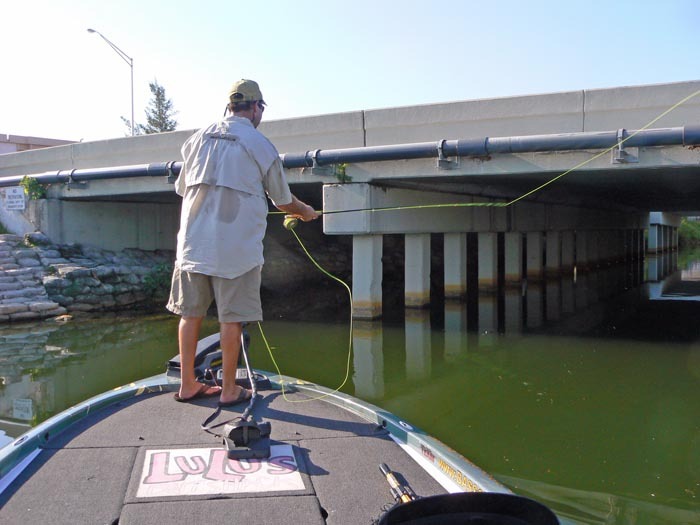 But Brett was traversing the canal system which means he was going between the pilings that hold up major South Florida roads like the Palmetto Expressway or I-95. This left very little room for mistakes. I distinctly remember ducking on one occasion while holding on to my hat and screaming "Holy, S...” that was close!" Needless to say, we arrived at the fishing grounds (a series of road pilings) in very short order. After catching my breath and changing my clothes, we grabbed our 5 and 6 weight fly rods , tied on a small Glades Minnow and set out fishing for the those beautiful Peacock Bass of Miami. Brett was immediately successful, having done this type of fishing for years. Me, a bit less so. He was out-catching me 4 to 1. But I was there for the experience. At least that's what I kept telling myself as I missed fish after fish. The fish weren’t big, but they were quite an eye treat. 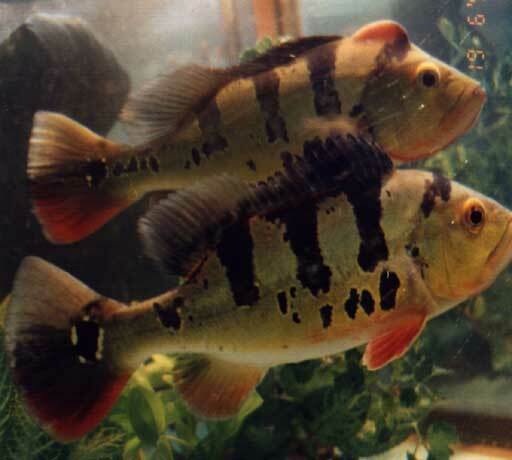 Peacock Bass (technically Cichlids and not really bass at all) are called by that name because they have a similar body shape. The main visual differences are the peacock style spot near the tail and the vertically marked stripes. Largemouth and Smallmouth Bass have no such spot and their stripes are horizontal and less-well defined. One more point; the male Peacock Bass has a protrusion on top of its head (see picture) while Largemouth and Smallmouth Bass have no such hump. We cast and trolled but rarely did we need to change the fly. There is not much living undergrowth to foul a fly in the canal system of Miami because there is so much pollution. Brett told me that he would never eat a fish that came out of the Miami canal system. He said the best place to catch and eat Peacock Bass was either in Broward County or up in the Palm Beaches (Lake Ida or Lake Osborne). The canals up there are much cleaner. Okay, I'm a Catch and Release freak anyway and wasn't about to eat those beautiful fish (well, maybe just one since it was allowed). But I decided to haul in a meal from one of the Palm Beach lakes at another date. While trolling we encountered huge iguanas (large, arboreal lizards, native to Central and South America, having stout legs and a crest of spines from neck to tail. ), basking in the sun next to all varieties of ducks and geese. Instead of the chirping of exotic birds we were treated to the barking of the local canine population. But it was a glorious day and I had a lot of fun even if the catch wasn't huge. Peacock Bass fishing:try it, you'll like it!! I was fishing on the railroad bridge in colon mi and lost a largemouth bigger than me and my cousin together.